In Hawaii, there is not a lot of art around town. There is only a small section of downtown that has murals on the walls from a local graffiti group called 808 Urban. However, the amount of street art is minimal and easily overlooked compared to places on the mainland that I have visited, which are brimming with modern art in the streets. 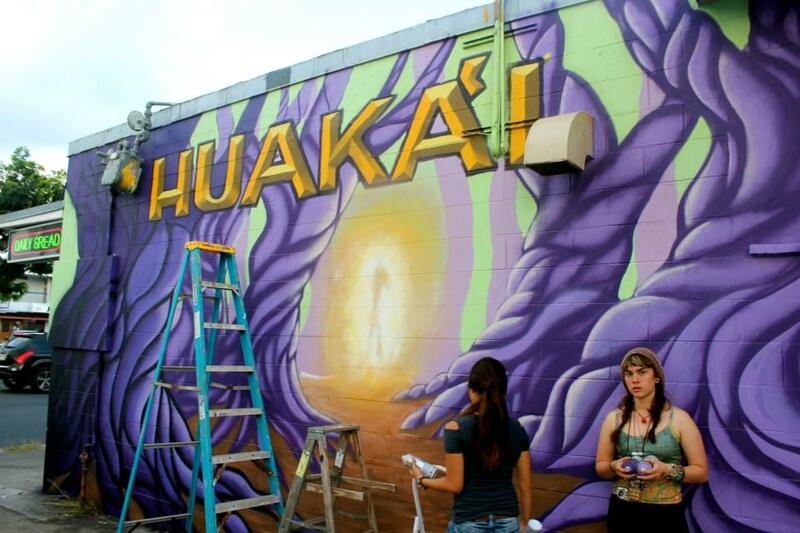 I want to help spread art and culture awareness in my community through murals that show what Hawaii really is. Over the years, we have lost touch with the `Aina, land, and our culture, and the best way to revive it is through visual representation. Some of the best murals that truly capture Hawaii for what it should be depict the royalty of old and our beautiful rainforests and ocean. With the dilapidated warehouses downtown taking up space and damaging the landscape, we are forgetting how the scenery should look like at a rapid rate. 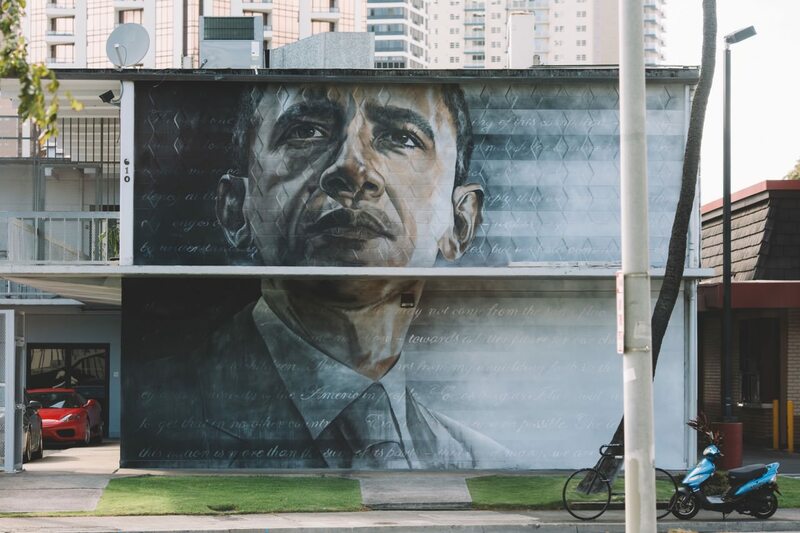 Art can help us remember and inspire us to revive Hawaii. My proposal is to make a digital piece or poster to spread around town or my school to motivate the citizens to produce art and reconnect with Hawaiian culture. “The sign of a great state or a great city is the strength of its cultural life, Our non-profit arts groups are a powerful economic force, and act as a magnet for tourism. Even more important, they help educate and inspire our citizens and stimulate creativity in the workplace and in our schools.” Says J. Clayton Hering, president of Northwest Business for Culture and the Arts in an interview. Art is important for our tourism industry, as it can represent our culture while looking aesthetic with the scenery. It is important to have murals and street art throughout the city to, as Hering said, stimulate creativity and educate citizens. Many tourists visit Hawaii to see the nature, but mainly stay in the very urban city. Because of this, we need to produce more art around the city for them, and for the locals. “Community art can also create attachment to one’s community,” says Penny Balkin Bach. Honolulu looks like any other city: tall skyscrapers, long highways, one-way streets, bike racks intwined with winding crosswalks, etc. The only way to stand out and show that this is really Hawaii is to add more Hawaiian flavor into our architecture and roadways. Everyday, I see this one mural by the freeway offramp to school. It is a simple mural, but I’ve seen it ever since I was 8 years old. I will never forget it. In a way, this mural connects me to Hawaii in a way nothing else can, as I grew up with it and understand its value and meaning. Those 3 men are famous Hawaiian men who reached out to the rest of the world by sharing their culture. I’m sure you’ve heard the song Somewhere Over the Rainbow sung byBrudda Iz. “Turning empty city walls into huge public canvases and the results of their labor can have a lasting effect on local neighborhoods,” says Grace McCammond, a muralist. This statement shows to be true, as more murals were commissioned from the state after the first few were so well recieved in the community. 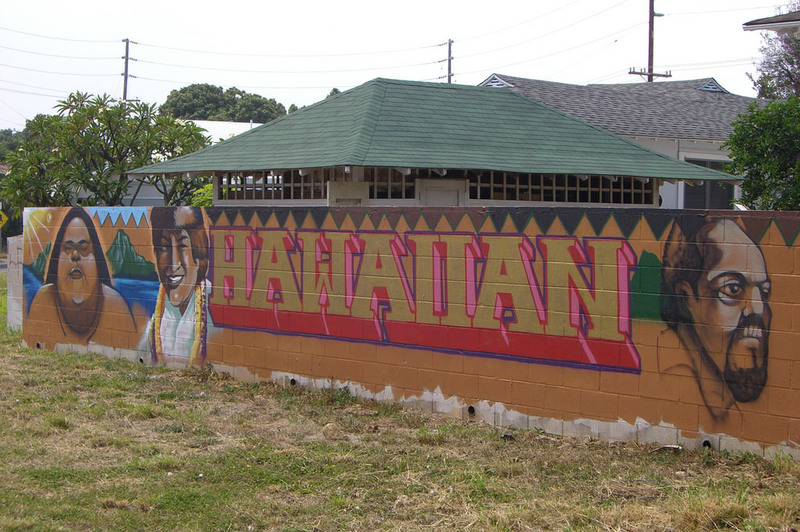 Many murals aren’t Hawaiian themed, which is okay since it is still bringing art into the bare city landscape. It also dispels the notion that modern street art is unwanted. While these murals and pieces are not Hawaiian themed, they are still promoting environmental awareness. “There is a common thread among contemporary young artists, which is a concern for land and the environment,” says Jay Jensen, contemporary arts curator at the Honolulu Museum of Art. I will make a poster that promotes making art with Hawaiian culture or environmental awareness. 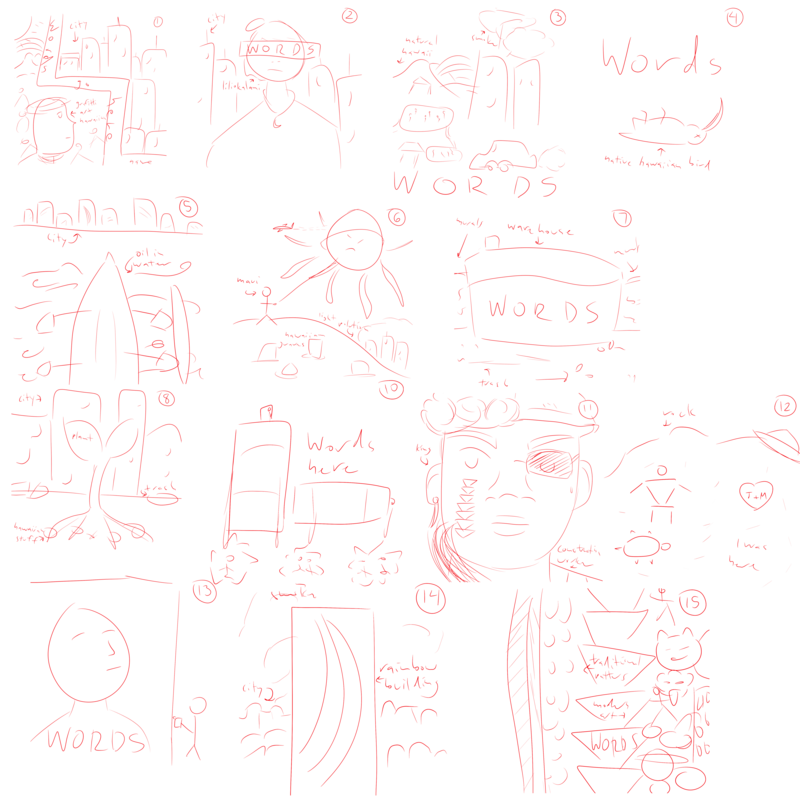 It won’t be an infographic, but I will add typography that will get the meaning across. In Hawaii, we have many slogans like “Keep the country country” and “Eddie would go” which are local Hawaiian values that we treasure and live by. I will take inspiration from these slogans to create my own piece with the value of restoring Hawaiian culture through art in mind. There are boards around my school where I can post these posters as well as post them on telephone poles around town. 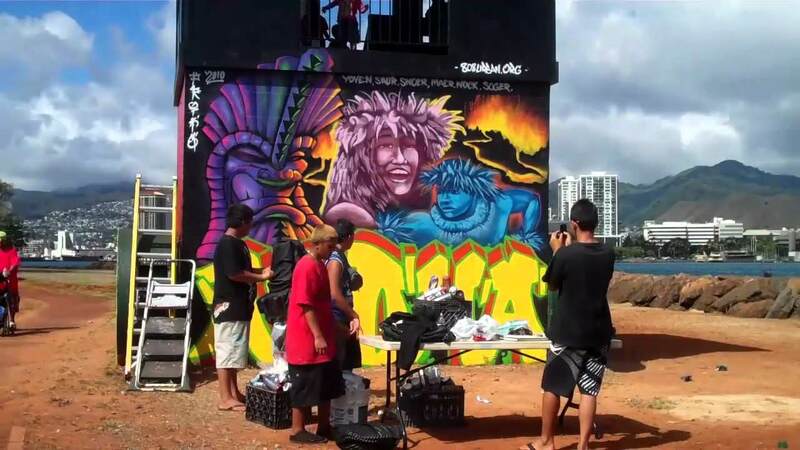 If I can’t do my original plan, I will volunteer at Urban 808 for a weekend and help with the process of designing a mural or piece of artwork. This is some of their works around downtown Honolulu. 1. The importance of the local issue is defined within the presentation. Hawaii is rapidly becoming more and more modern and industrialized. At this rate, more rainforests and ancient Hawaiian land will be lost. The locals know this, but there is not enough motivation to make a stand. However, artists can provoke motivation by showing the harsh reality through visual concepts. I feel that making posters about this topic will trigger a starting point in people who see them. 2. 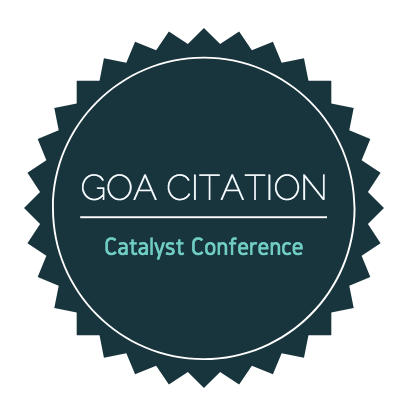 A clear strategy for catalyzing change is identifiable. I will make posters that have messages on them that the locals will understand and the tourists will feel guilty about. Hawaii is not some ideal vacation spot for rich white people who want to get away to an exotic dancing-tiki-torch-lit luau. Our ecosystem is dying and our native species are being overrun by pests brought in from the mainland. Change needs to happen and art is one of the best ways to start that change. 3. Presentations demonstrate an anticipation that visitors may have limited background knowledge on their topic. It is already a well-known fact that industry ruins environment. It is no different in Hawaii than it is anywhere else. Except Hawaii is an island 5 hours off any large landmass and if things get too extreme, we have no resources to save us if connection is lost with the outside world. With the city continuously growing, Oahu’s natural sections of the island are dwindling fast, turning into abandoned warehouses, dumps, and townhouses. While it may seem as progress, we are killing native plant and animal species that cannot be found anywhere else in the world. Have you heard of the `Apapane? Didn’t think so. And in 20 years, Hawaii’s youth won’t know what it is, either. I want to get this message across through my poster with a powerful image of contrasting ideals and reality. My goal for my piece was to get people interested, not tell them directly what my project was about. If I were to make this a serious project, I would setup a website to go along with my poster where people can read up on my mission statement and what they could do to start change in the community. I used my sketches and research from the earlier steps to figure out that this image would have the most impact. The focus was on a dead native Hawaiian bird, and people from Hawaii would immediately recognize what type of bird it was (since we don’t have a lot of red cardinals it wouldn’t be mistaken for that). Behind is the growing city with I purposefully colored drab, contrasting colors to make the bright red even more noticeable. I also wanted the words to be very simple. Something everyone knows means it’s an important statement and gets people to wonder what it means this time. 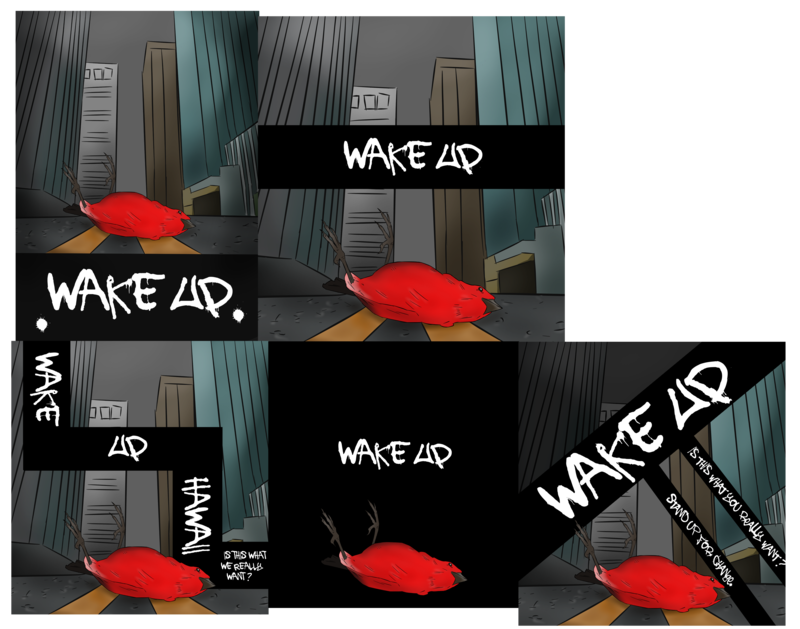 Here are the 5 final pieces. I personally like the last one the best. Here is the process video showing how I made each piece. This is the final editing of the piece and the final. This is the final image. So I know the criteria was to allow people of all backgrounds to understand the poster, but since my topic is very based on Hawaii, I couldn’t make it so everyone would understand. Either way, I don’t think non-Hawaiians would need to care about it, anyway. However, regardless of knowing it’s a Hawaiian bird dead on the road, anyone can understand that dead animals in a dreary urban city doesn’t mean anything good. 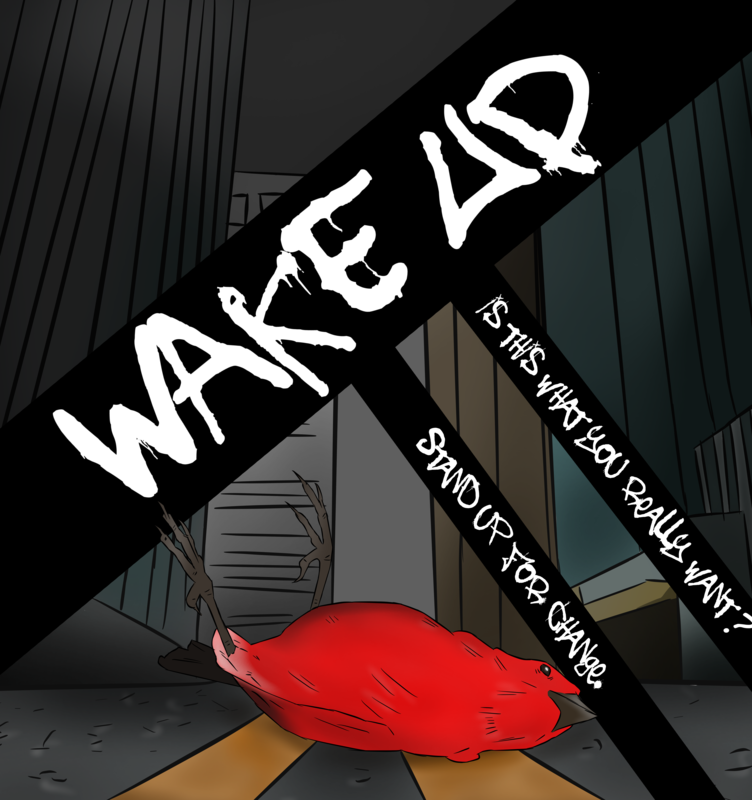 Also given that it’s dead and I used the slogan “Wake Up”, it makes what I’m trying to convey pretty apparent. For the final, I focused on darkening the not so important areas so the eye would be attracted to the middle and the words. The contrast between light and dark, vibrant and unsaturated, and placement all work to serve my center piece. I think the font choice helps people understand that this is not some formal Times New Roman ad for donating to bird sanctuaries, but to start a revolution of change because it is urgent.